Jerold Darwin Hall, 71, was called back home Wednesday, September 27th, 2017 (48 years to the day that he met his sweetheart for the first time on a blind date). Perhaps this was fitting because he always seemed to understand the significance of meaningful dates and anniversaries throughout his life. Darwin was born to Jerold and Christeen Hall in December of 1945 in Mesa, AZ. He lived a happy, fun-filled life surrounded by many loving family and friends. He was an active and faithful member of the Church of Jesus Christ of Latter Day Saints. He married his sweetheart and the love of his life, Terri Tate, on Friday, February 13th, 1970. With her by his side he spent the last 47 years being a kind, loving patriarch over his family that included 6 children, their spouses, and 26 grandchildren. 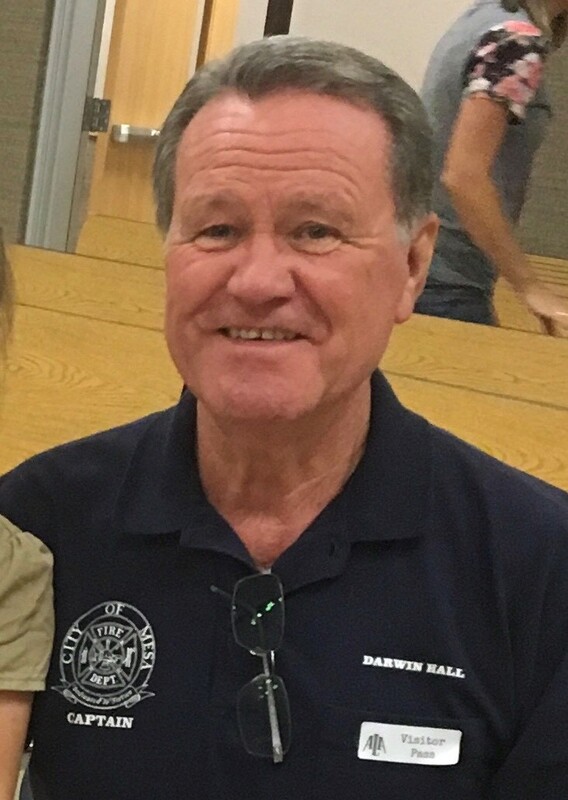 In 1975, Darwin began a career of serving others with the Mesa Fire Dept. He loved caring for his community and found a great calling in helping those in need. He particularly enjoyed the comradery and brotherhood he felt with his fellow firefighters. After 25 years of service, Darwin retired as a Fire Captain on Feb 29th, 2000. As an example of hard work and a continued desire to serve others, Darwin drove a bus for Mesa Public Schools Athletics during his days off as a firefighter. He would consistently seek out and request the “best” athletic events that involved his alma mater, Mesa High, where he was a graduate of the Class of 1964 and standout on the Varsity Basketball team. He greatly enjoyed driving the team bus and cheering them on to countless victories before retiring from MPS after 35 years. Darwin is survived by his loving and caring wife, Terri, their 6 children – Evi (Brett) Fyffe; Wendi (Dan) Roberts; Jon (Lanie) Hall; Ryan (Celeste) Hall; Brandon (Jami) Hall; Shelbi (Denver) Whittaker; 13 Grandsons and 13 Granddaughters, his amazing Mother, Christeen Nielsen Hall, and sisters Pam (Dave) Councilman; Marsha (Paul) Snow; Jerrilyn (John) Wilcken and many nieces and nephews. Darwin is preceded in death by his Father, Jerold John Hall. Funeral services will be Friday, October 6th at 12:00 pm with a viewing before from 11:00-11:45am at the Kimball Stake Center, 1266 S. 32nd Street in Mesa, 85204. Mesa City Cemetery following. There will also be a viewing on Thursday, October 5th from 6:00-8:00 pm at Bunkers Mortuary, 33 N. Centennial Way, Mesa 85201. We can’t begin to tell you how sorry we are to hear of Darwin”s passing. You and your family are in our prayers and hearts. So sorry for your loss, very special man preparing a place in heaven for his family. I remember brother Hall. We used to be in the same ward when our children were young. Sorry to hear of his passing. Prayers to all the family and friends that will be mourning this loss. Hugs and prayers to you and your family, Terri for strength in the coming days. May you all reflect on the wonderful memories you’ve made over the many years as you work through your grief. Darwin was a wonderful person, nice to all, and will be missed. Our love and prayers go out to each member of your family. We loved being in the Windsor ward watching the Halls raise their children and the great example that both Darwin and Terri have always been. Darwin has always been an my idol – a great husband, a great father, and a great priesthood holder. The world has lost a great man today but heaven has gained a valiant son! May we all try to live our lives more live Darwin! I am sooo sad to hear of the passing of Darwin Hall .. we grew up in the same Ward so many years ago, we were friends, our parents were friends .. I always had the highest regard for their family. It is so sad for the void his family left behind must endure, but I’m sure Heaven is cheering. I became a friend of Darwin at Lehi school through our graduation. Saw him at all reunions and during our last visit to Mesa was able to attend the Gilbert temple with him and Terri. He was a true friend. It is sad to loose a loved one as I lost Judy 3 months ago. Always remember his strong testimony. My prayers are with you. May you find comfort and joy at this time of loss and sorrow through your knowledge of the gospel and love of your children, family and friends. Love you! Our sincere condolences to the entire family. May God bless you with increased comfort and understanding. My prayers are with your family. As his next door neighbor for a while, I will always remember Bro. Hall as respectful, kind, gentle person. We are so sad to hear of Darwin’s passing! Seeing him at the temple was such an uplifting experience. He had the radiance of a disciple of Our Savior. He was such a good friend to all. Teri, we add our love and prayers on your behalf! May you find peace and comfort in the future! Dear Terri, we add our love and prayers to all your family and friends. I was in the army reserves with Darwin in the early ’70. We were in the 6251st US Army hospital. I have great respect and appreciation for both of you. Darwin is such a soft spoken gentleman. Terri, may you and your family be comforted and strengthened during this heart wrenching time. Mrs. Hall I am so very heartsick to here of Darwin’s passing. I met Darwin at Mesa Public Schools 25 years ago. He was loved by all who knew him. Sending prayers to you and your family. Dear Terri, We just want to express our Sympathy and Love to you and your family. We LOVED Darwin. We know how precious his family was to him! He was one of the most loving, kind and giving people we have ever known! If we can serve you or your family in any way-we are here for you! Terri. I just today heard about Darwin. He always had a big smile and warm handshake. I am so very sorry and send my deepest sympathy, love, and prayers to you and your family. I loved Darwin like a brother. We were out of town at his passing and his funeral. I feel like I was cheated in not being there to honor my good friend. My love to you Terri and your children. Darwin loved and cared about everyone. What a blessing to be counted as his friend. We did not know Darwin, but his father was called as Bishop of the 28th Ward soon after we moved in and we loved this humble man and his amazing and beautiful wife Christeen and got to know Roland and Charlene Nielson and many of his cousins who babysat our boys-love them all!!! !